Jesuit priests and Georgetown University repented for their involvement in the slave trade with a special “Liturgy of Remembrance, Contrition and Hope” on Tuesday at the school. In 1838, Georgetown University sold 272 slaves in order to keep its school afloat financially, according to a report in the New York Times. The university invited some 100 descendants of slaves sold by the Maryland Jesuits to the service. 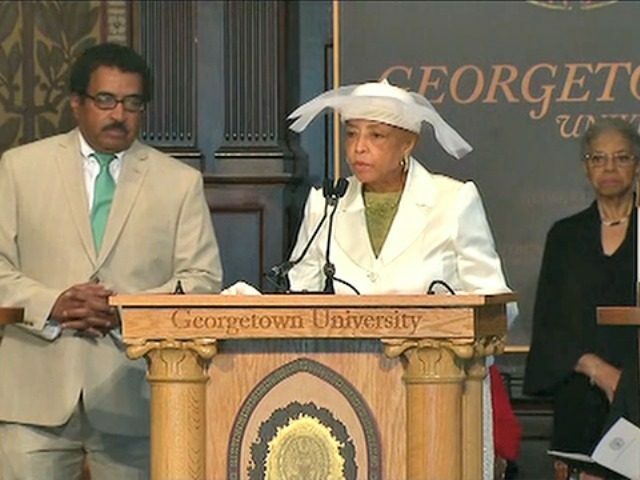 One of them, Mary D. Williams-Wagner, read a passage from Frederick Douglass’s Life of an American Slave. In September of 2015, DeGioia convened a working group at Georgetown to make recommendations regarding how to address the school’s participation in slavery. Georgetown’s president met last summer in New Orleans, Baton Rouge, and Maringouin, Louisiana — as well as Spokane, Washington — with descendants of the 272 slaves sold by the Jesuits. “The most appropriate ways for us to redress the participation of our predecessors in the institution of slavery is to address the manifestations of the legacy of slavery in our time,” he said. The working group’s recommendations included renaming some campus buildings – originally named for Jesuits who participated in the sale of slaves – with the names of slaves sold. Georgetown has reportedly planned a “libation ritual” as well, with soil from a former Louisiana plantation, to memorialize the 272 slaves sold by the Jesuits. About a dozen universities, including Brown, Columbia, Harvard, and the University of Virginia, have made public their participation in the slave trade.